This is the fake opening line in case the computer freaks out again and doesn’t show it. You haven’t wasted that much time reading this, so move along. This was supposed to be an easy post to write. I was going to tell the amusing story about how one of my errands in Lincoln this evening was to buy some replacement toilet levers. The children flush the toilets a hundred million times a day at the center, and we go through toilet levers like toothpicks. I usually get replacements from Wal*Mart, but after tossing a few, I decided that industrial strength levers would be a wiser choice. Off to Menards I went! “Can I help you?” said Really, Really Young Menard’s Assistant. “This replaces those?” I asked incredulously, gesturing at the now-worthless old-style levers. “I guess,” said RRYMA, who really should have told his mother that he had a job at Menard’s. She’s probably worried sick. “I’ll take them all!” And I did. Push-button. Sheer genius! No preschooler can break off a push-button! Well, not without really, really trying. I bought enough for school and one for home. I figured I could work out the kinks of installing it here. That’s where the story breaks down. First of all, it needs a teeny-tiny Allen wrench and they don’t include one. That resulted in a 20-minute search of the disaster area workbench. I couldn’t find it, and asked Lloyd to come and help look. “Where did you put it?” he asked, knowing the answer. No Allen wrench, but a doodad on his pocketknife worked out. However, the arm on this thing is too short and it bends the wrong way, so when I push the button, the flap comes up a little and then goes right back down. I’ve tried bending the arm somewhat, but that seems stupid. Am I supposed to hold the button in for a while to flush it? I give up for tonight. Some fancy folks better give me uppity toilet advice or I’m going to burn my toilet. 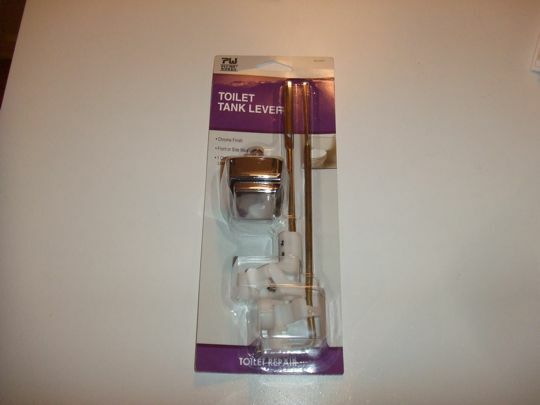 I’m not fancy, so I won’t give you any advice, but I’ve often had to make adjustments when installing new toilet levers. Even fancy ones. Our basement toilet requires a long holding period before if flushes. Long as in, until-you-hear-the-*galoop*-of-the-water-all exiting-long. Therefore, my children refuse to flush the toilet in the basement. Be sure to take photos of that—the toilet burning! ‘Where’d you put it? Down.‘ HA!! Sorry, I don’t have any toilet fixin’ advice. What did Spock see when he went to the toilet? I’m stumped on the second one, but I’m determined not to look it up online. But I really like the Vul-can! HA!!! HAHAHA the putting down of stuff….I know it all so well. Tweezers and scissors are put down here and never found again.